The Expert Advisor works on sharp price movements; it can apply open position locking and pyramiding. Virtual stops are used (take profit, trailing stop), to limit losses, order locking and stop loss are used in% of balance. At the same time, several dozens of orders can be opened and the advisor will need free funds to exit the locks and close all positions for total profit, this should be taken into account when choosing the number of instruments for trading. The work of the adviser does not depend on the timeframe on which it is installed, only the price and time are used in the calculations (but for testing and optimization it is still better to use M1). To work on a real account, currency pairs with a minimum spread and high volatility are recommended: EURUSD, GBPUSD, AUDUSD, USDCAD, USDCHF, USDJPY, NZDUSD. 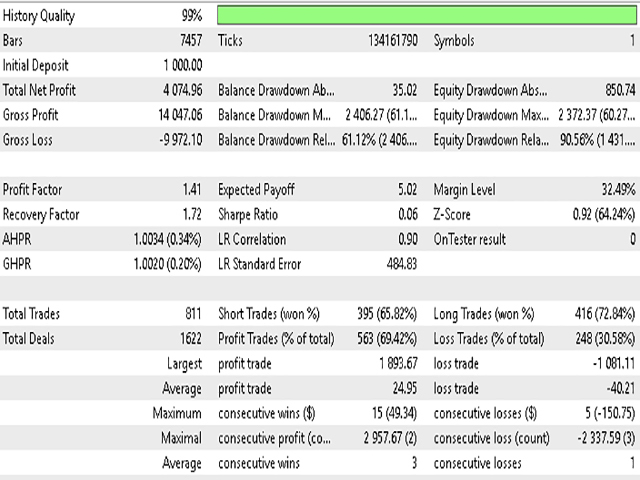 The Expert Advisor was developed for trading currency pairs and was not tested on metals, contracts, promotions, etc. Before installing on a real account, test the Expert Advisor on real ticks for at least the last 3 months. The recommended minimum deposit is $ 500 per starting 0.01 lot.